On Friday evening the sleepy city of Norwich was invaded by prehistoric creatures and otherworldy beings! I was puppeteering with Dutch street theatre company Close Act in the spectacular opening performance of the Norfolk and Norwich Festival. Ploughing through a crowd of thousands with a pterodactyl on a stick, chasing a dancing eyeball, under the enchanting spell of the Red Goddess singing from her aerial perch ... I know right?! 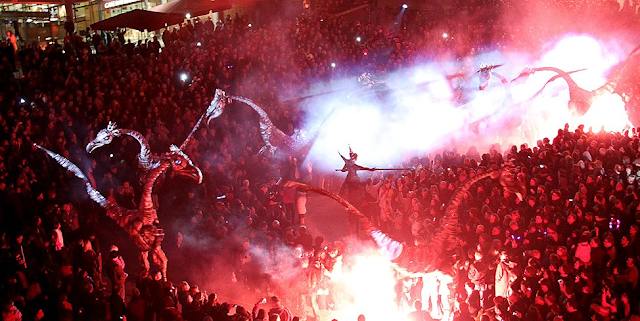 Top photograph is from the BBC website and shows the Saurus beasts and the witch on slits. Bottom photographs are my own from rehearsals. I was puppeteering with my bezzie pal and incredible sculpter Bex Cross, check out her site Free Flow Sculpture!